Sanjay Leela Bhansali’s upcoming film Padmavati has been mired in controversy for almost a year now. The film — starring Deepika Padukone, Ranveer Singh and Shahid Kapoor — tells the story of Alauddin Khilji, the medieval-era Delhi ruler, who fell in love with Rajput queen Padmavati. But many fringe groups, including the Shri Rajput Karni Sena, an organisation of the Rajput community, claim the film has distorted historical facts and have opposed the film’s release with threats and acts of hooliganism. As the outrage for a film that people are yet to watch continues, let’s look at all the problems and setbacks faced by Bhansali and co in the last year or so. 25 December, 2016: A painter, Mukesh Dakia, suffers a head injury on the sets of the film and is declared dead on arrival at Kokilaben Hospital, Mumbai. 27 December, 2016: Film Studio Setting and Allied Mazdoor Union demand compensation for the family issuing a notice to Bhansali. 4 January, 2017: The family of the deceased painter receives a compensation of Rs 23 lakh after a mutual understanding is reached with Bhansali. 27 January, 2017: Activists of a Rajput organisation, Shree Rajput Karni Sena, claim the director is “distorting” historical facts in the film, with the organisation’s patron and founder Lokendra Singh Kalvi saying “In no book is it written that Alauddin Khilji fell in love with Padmavati or he was her lover.” They protest and misbehave with the film’s crew during a shoot in Jaigarh Fort. They assault Bhansali by slapping him and tearing up his shirt. They also damage some cameras and other equipment, forcing Bhansali to stop shooting. Bollywood celebrities including Priyanka Chopra, Mahesh Bhatt and Anurag Kashyap take to social media to express their anger and shock. The Film & Television Producers Guild of India Ltd urges the government to take action. 28 January, 2017: A day after the assault on the sets, Bhansali decides to cancel shooting in Jaipur. The director clarifies in a statement that there is no dream sequence or objectionable scene between the characters of Rani Padmavati and Allauddin Khilji. 31 January, 2017: Bhansali Productions reach a truce with Shree Rajput Sabha regarding the latter’s objection to possible distortion of facts in Padmavati. 14 February, 2017: Shree Rajput Karni Sena say there is a need to create a ‘pre-Censor Board’ to monitor all period films and prevent any misrepresentation of history. 6 March, 2017: Shree Rajput Karni Sena enter the Padmini Mahal in Chittorgarh Fort in Jaipur and break the mirrors famously known to have reflected the image of Rajput queen Rani Padmavati for Delhi Sultan Alauddin Khilji’s viewing. 15 March, 2017: Two dozen unidentified miscreants torch a huge outdoor set of the film in Kohlapur. Since the fire brigade could not reach the disaster site in time, villagers help douse the fire and move the people and animals, mostly horses, from the site to safety. Trunks full of detailed costumes and accessories for the film are reduced to ashes. Maharashtra Minister of State for Home Deepak V Kesarkar says Bhansali had declined night security for the film set in Kolhapur. 21 September, 2017: Lokendra Singh Kalvi reiterates that his organisation will oppose the film’s screening if facts are “distorted”. 23 September, 2017: A group of protesters from Shri Rajput Karni Sena gather in front of Rajmandir Cinema Hall in Jaipur and shout slogans against Bhansali and burn posters of the film. 9 October, 2017: The trailer for the film is released. 2 November, 2017: BJP write to the Election Commission seeking a ban on the release of Padmavati till after the Gujarat Assembly elections on 9 and 14 December claiming claimed the movie would hurt the sentiments of Kshatriya and Rajput communities for its “wrong depiction of history”. Senior Congress leader and national spokesperson Shaktisinh Gohil says if there is actually “distortion of history” in the movie then it should not be released at all. 3 November, 2017: Protest by the Karni Sena against the film picks up pace in Rajasthan with a complete bandh observed in Chittorgarh. 6 November, 2017: Brahmin organisation, Sarv Brahmin Mahasabha, oppose the film’s release noting they will not tolerate “distortion” of historical facts at any cost. 7 November, 2017: T Raja Singh, a member of Telangana assembly, calls upon people to boycott the movie believing the filmmakers were trying to denigrate Rajput community. He threatens to burn down theatres during screening and even announces that he will bail out youth if they are arrested for setting afire the theatres. Film distributors in Rajasthan, meanwhile, are wary of releasing the film. Diya Kumari, of the former royal family of Jaipur, says if the movie does not display authentic history or takes any liberties, it will not be allowed to be released. “Rajputs will not allow any distortion of the valiant history of Rajasthan and sacrifice of its people in fighting barbarians,” she says. 8 November, 2017: Following widespread criticism against his yet-to-release film, Bhansali posts a video saying the film upholds the honour of Rajputs and does not depict anything that may hurt anyone’s sentiments. 9 November, 2017: Baijiraj Trivikrama Kumari Jamwal, daughter of Mahendra Singh Mewar (the 76th Maharana of the Mewar dynasty), says the controversy is generating “free publicity” for the film. “Instead of making it clear that it is Bollywood masala, you’re saying it is history and misleading and ‘miseducating’ the future generations,” she adds. 10 November, 2017: BJP’s Arjun Gupta urges in a letter, addressed to Home Minister Rajnath Singh, that Bhansali should be tried for treason for distorting history. The Rajasthan government plans to set up a committee to watch the film. The Supreme Court refuses a plea seeking to ban the release of the film. The apex court says it could not intervene since the Central Board of Film Certification (CBFC) was yet to decide about the certification of the film. 11 November, 2017: Maharajkumar Vishvaraj Singh, son of Mahendra Singh Mewar, pens a letter to Prime Minister Narendra Modi, Minister of Information and Broadcasting Smriti Irani and censor board chairperson Prasoon Joshi, among others, urging them to withhold the certification and release of the film. 13 November, 2017: Members of Indian Film and Television Directors’ Association (IFTDA), Cine and TV Artists Association (CINTAA), Western India Cinematographers Association (WICA), Screenwriters Association (SWA) and Association of Cine and Television Art Directors & Costume Designer appeal to Smriti Irani and Rajnath Singh to allow freedom for filmmakers in the wake of the controversy over the film. Meanwhile, Haryana Health Minister Anil Vij joins the anti-Padmavati bandwagon and asks the censor board to stall its release. 14 November, 2017: : Karni Sena activists vandalise a theatre in Kota, Rajasthan after reports that it was showing a trailer of Padmavati. The protestors pelt stones and break windowpanes, gates and the ticket counter and also damage some office furniture. 15 November, 2017: : The Maharashtra government provides a precautionary security cover to Bhansali amidst increasing controversies and growing threats ahead of the Padmavati‘s release. Shri Rajput Karni Sena calls for a ‘Bharat Bandh’ on 1 December if the film releases on that date. Congress says if there are scenes that hurt the sentiments of a particular community, the same need to be reviewed. The Uttar Pradesh government writes to the Union Secretary of Ministry of Information and Broadcasting requesting them to ensure that the prospects of public outrage and unrest over the film are considered owing to twisting of historical facts before certification of the film by CBFC. CBFC chairperson Prasoon Joshi says he is yet to watch the film, contrary to reports. 16 November, 2017: : Karni Sena leader Lokendra Singh Kalvi threatens to cut actress Deepika Padukone’s nose amid a call for “Bharat Bandh”. Sarv Brahmin Mahasabha, an organisation of the Brahmin community, organises a blood signature campaign to request the CBFC to ban the film. 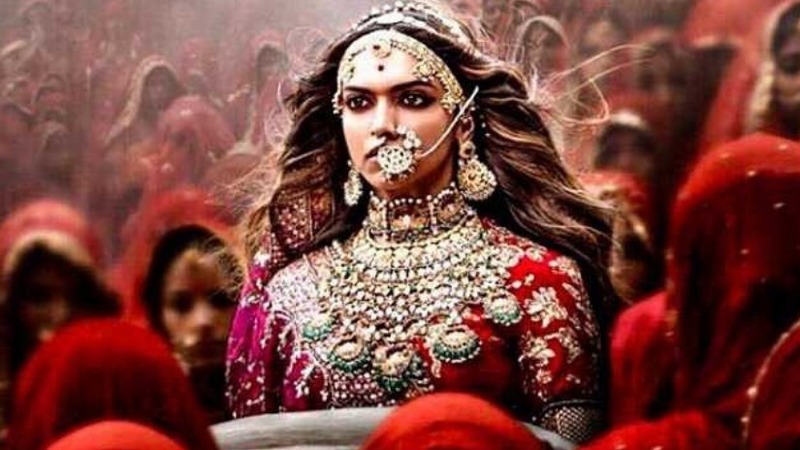 Thakur Abhishek Som of Sardhana Chaubisi, who claims affiliation to the Samajwadi Party, announces a bounty of Rs 5 crore on the heads of Bhansali and Padukone for “wrongfully portraying” queen Padmini. Union Minister Uma Bharti hits out at Bhansali for not taking care of sentiments of the Rajput community. 17 November, 2017: : Entry to the famous Chittorgarh Fort in Jaipur was closed in protest against the film. Tourists visiting the fort were requested to go back. In other parts of Rajasthan, including Jaipur and Ajmer, protests are held by the Karni Sena. In Ajmer in front of a picture hall, miscreants put up a poster saying that Padmavati will not be released. Mumbai police has warned individuals and groups against taking the law into their hands while protesting.